The DECOVALEX project is an international research and model comparison collaboration. Aim of the project is to advance the understanding and modeling of coupled thermo-hydro-mechanical (THM) and thermo-hydro-mechanical-chemical (THMC) processes in geological systems. Prediction of these coupled effects is an essential part of the performance and safety assessment of geologic disposal systems for radioactive waste and spent nuclear fuel (http://www.decovalex.org). DECOVALEX -2015 is the current and 6th project phase of the collaboration of regulatory authorities and nuclear waste management organizations initiated in 1992. In Task B1, Kiel University and the Swiss Federal Nuclear Safety Inspectorate ENSI collaborate in the development of numerical models to reproduce the laboratory experiments performed in the Task B1 and deepen the understanding of the THM processes that take place in the buffer material and surrounding host rock where the radioactive material might be stored. 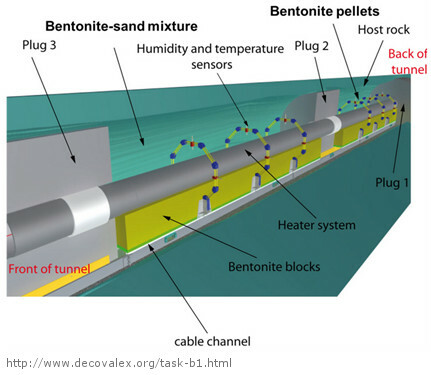 Figure: Virtual 3D-view of the DECOVALEX HE-E experiment on the effects of heating on bentonite and the surrounding host rock (Source: http://www.decovalex.org/tast-b1.html).